28 JUNE: A total of six C-54 aircraft began leaving Itazuke Air Base at 6 AM, flying to Kimpo picking up evacuees and returning to Itazuke with the first two returning at 0830. A total of 203 persons were evacuated. 28 JUNE: The President authorized Air Force planes to begin attacking North Korean troops and installations. 29 JUNE: The following units of the 19th Infantry Regiment had just completed their third week of an eight week amphibious training at the Eighth Army Amphibious Training Center at Camp McGill, Yokosuka, Honshu, Japan, close by the old Japanese Naval, Base at Yokosuka. It was operating primarily by U.S. Marines on loan to the Far East Command (FEC) from the Navy and had been operating there for about six months. The units of the 19th Regiment were: First Battalion (Bn), Heavy Mortar Company (Co.), parts of Regimental Headquarters, a Bn Aid Station and some Engineer and Artillery sections. North Korean units captured Kimpo Airfield. U.S. aircraft strafed North Korean troops and pack animals crossing the Imjin River. Truck and tank convoys near Munsan were attacked. A railroad bridge north of Munsan was bombed. A troop train near Kaesong was attacked with rockets, bombs and machine gun fire. A new landing bly North Korean forces, supported by four unidentified vessels (South Koreans say they were Russian destroyers or cruisers.) in the vicinity of Mukhojin-ni north of Samchok. The same source reported five (5) inch guns shelling the beach area. Five hundred North Koreans were reported advancing toward Yongdok. Chinju was rumored to be under attack by North Korean guerrillas. Chinju was reported to have been strafed by North Korean aircraft. Another 186 evacuees from Korea arrived in Fukuoka by boat. By the end of the day a total of 2,174 evacuees from Korea had arrived in Japan. 30 JUNE: At 1130 hours those units of the 19th Regiment undergoing amphibious training at the Eighth Army Amphibious Training Center at Camp McGill were alerted to move by train to Beppu and their base at Camp Chickamauga on the southern island of Kyushu. They had been training there because General MacArthur thru the Eighth Army commander, General Walker had ordered that at least one battalion of each regiment undergo amphibious training. The 34th Infantry Regiment was alerted for movement by water to Korea. As of this date, 1,758 evacuees from Korea have been processed by various units of of this division. 1 JULY: The commander of the 19th Infantry Regiment, Colonel Meloy and key staff members flew from Yokohama airport at 1300 for Kokura airport on Kyushu. The first part of Task Force Smith, 1st Bn, 21st Infantry, flew began leaving Itazuke Air Base at 1105 to the airport at Pusan. Upon arrival they immediately left by train for Taejon. The main body of the 19th Regiment units at Camp McGill began boarding trains at the Yokusuka train station at 8:00 PM. 2 JULY: One thousand, four hundred and sixty three officers and men of the 34th Infantry Regiment sailed from Sasebo at 7:20 AM, arriving at Pusan at about 7:30 PM. The balance of Task Force Smith began flying from Itazuke Air Base at 8 AM with the last of them arriving by noon. They immediately were loaded on a train for Taejon. Meanwhile, the first elements of the Task Force had arrived in Taejon where Lt. Colonel Smith and the officers who had arrived with him drove to Osan to look at possible defensive positions north of Osan. The 2nd Bn of the 21st Regiment and the 1st Bn minus the men of Task Force Smith left for Sasebo to board a Japanese freighter, the "Shinano-Maru" (picture appears below). "Shinano" is Japanese for China. The Shinano-Maru was built by the Henderson Company in Glasgow, Scotland in 1900 and was scrapped in 1951. It weighed 6538 tons and was over 405 feet in length. During the Russo-Japanese war of 1904, it was one of three picket ships stationed across the Tsushima Straits and was the first Japanese ship to sight the Russian Baltic Fleet, which was just completing an 18,000 mile trip from the Baltic to reinforce the Russian Pacific Fleet. Because the fleet was running low on coal, instead of taking the safer route out to sea east of the Japanese mainland, it was taking a shorter route which took it between the Japanese mainland and the Asian coast. It notified the main Japanese fleet, which intercepted and destroyed the Russian fleet in the battle of "Tsushima Straits". Six 105mm howitzers, 73 vehicles and 180 men of the 52d FA Bn left Hakata, Japan under the command of Lt. Colonel Miller O. Perry on an LSTto furnish artillery support for Task Force Smith. They left at 4:10 A.M., arriving in Pusan at 10:11 PM. 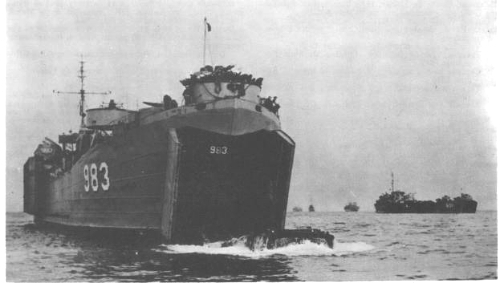 Most LST's were about 325 feet long and about 50 feet across at the upper deck. When operated by the U.S. Navy, they were manned by 8 to 10 officers and 115 enlisted men. They were armed with .50 caliber, 20mm and 40mm anti-aircraft guns. However most of the LST's used at the beginning of the Korean war had been transferred to Japanese control for use as freighters as most of the Japanese freighters had been sunk during WW II. They had Japanese crews and captains and all of the armament had been removed before their transfer. They had a speed of about 9 knots and could carry 2,100 tons of cargo. They could carry as many as seven heavy tanks. Note the ramp in front, which is down in this picture. Tanks and other vehicles exited over this ramp, which was let down close to shore. A second Japanese freighter, the "Sohu-Maru" and an LST also sailed for Pusan. Just before the "Sohu-Maru" left, the local military commander called and said that he had three North Korean prisoners who had been picked up by the Navy and said that they had to be returned to Korea. The three prisoners were brought on boar and placed in an improvised brig (jail cell). The "Sohu Maru" and the LST left to join a convoy already underway for Pusan. 3 JULY: Major General Dean, Commanding Officer of the 24th Infantry Division had been scheduled to fly to Taejon on July 2 to relieve Brigadier General Church. When General MacArthur and staff flew to Suwon, Korea on June 29th, he placed General Church in command of all U.S. forces in Korea. Because of bad weather, he did not arrive until this afternoon. When sending Lt. Colonel Smith off from Itazuke on July 1, he had instructed him "Go as far north as you can and make your stand there". However, the overcautious General Church split the forces of Task Force Smith, instead of sending it approximately 80 miles north to Osan, he sent half of it about 45 miles north to Pyongtaek and the other half to Ansong, which was about 20 miles east northeast of Pyongtaek. Had they gone directly to the Osan area, they could have arrived there late on July 3 and had all day to prepare his position, including burying communication lines where they crossed the road so that tanks going down the road would not cut them. In addition, they quite possibly would not have been strafed by those four Australian F-51's which wounded a heavy weapons platoon leader and destroyed nine 75mm recoilless rifle rounds. The Shinano-Maru sailed for Pusan in the early morning. The units of the 19th Infantry Regiment which had been undergoing amphibious training at Camp McGill arrived at the Beppu railroad station at 2:00 AM. Later that day, they received 238 replacements, most of whom were from the three other Divisions in Japan (First Cavalry Division (Infantry), 7th Infantry Division and the 25th Infantry Division). I spoke with one member of the 21st Infantry Regiment. He had enlisted in 1948, came to Japan and was assigned to the First Cavalry Division's 99th Field Artillery Battalion. In the spring of 1949, he and several hundred other artillerymen from that unit were transferred to the 7th Infantry Division. On July 1, 1950 he and many other members of the 7th Division Artillery were transferred to the 24th Infantry Division Artillery. Bause the commander of the 24th Division Artillery was in the U.S. on an emergency leave, Brigadier General G. B. Barth, who was the commander of the 25th Infantry Division Artillery, arrived early in the morning and took temporary command of the 24th Infantry Division Artillery. At 4:00 PM, the 52d FA Bn, less the units supporting Task Force Smith, plus the advance parties of the 13th and 63d FA Bns sailed from Hakata on the ship Pembina and arrived at Pusan at 8 AM the next day. The balance of the 1st Bn sailed on a Korean merchant ship called the "William Lester", which was captained by an American Merchant Marine Officer. Two more LST's arrived, were loaded and left later that evening at about 8:00 PM, escorted by an Australian cruiser, according to an entry in the the second paragraph of the 21st Infantry War Diary for this date. 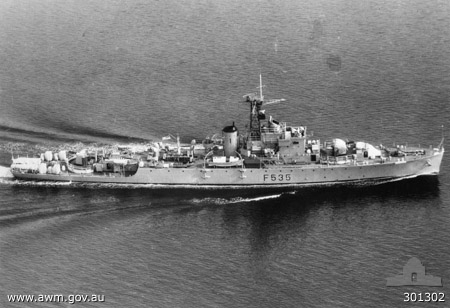 Official records show that the only Australian Navy Ships were the destroyer (Her Majesty's Australian Ship) HMAS Bataan and the frigate HMAS Shoalhaven, both shown below. The Bataan had two twin gun turrets forward and two more aft. Most U.S. destroyers had only one gun turret aft and many only had two one gun turrets forward, although the Mansfield Class had twin gun turrets forward. Observers not familiar with naval vessels must have thought it was a cruiser, although the Bataan was about the same size as U.S. destroyers. 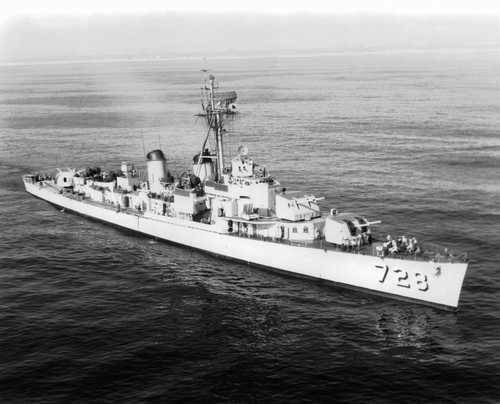 (See photo of the USS Mansfield-DD728 below the photo of the Shoalhaven. The Bataan, Shoalhaven and Mansfield were operating as escorts at about that same time. When construction was begun, by custom, its name was to have been the name of one of the aboriginal tribes in Australia. Because of the presence of General MacArthur and his family in Australia, when the ship was commissioned, it was christened "Bataan" by Mrs. MacArthur. The commissioning took place just in time for the Bataan to be present in Yokohama Harbor for the surrender ceremonies. The ship turned out to be a "jinxed" ship as almost everything that could go wrong did. Australian Navy personnel blamed the bad luck on the fact that the original name of the ship had been changed. After the signing of the Armistice in Korea, the Bataan was scrapped after having been in service for less than fifteen years. 5 AUGUST: A radio net using thirteen LST"s and one APA anchored off Masan which were supporting the First Provisional Marine Brigade. This net serviced all units operating in the Masan area and also connected to the Pusan net.